As a product creator, you need ways to promote your products without having to invest a lot of time, energy, and money. So thats why having an affiliate program can multiply your profits many times over. If youre not familiar with what Im talking about and you want more high converting traffic to your products and services, then let me explain in a little more detail. An affiliate program is a program that can be part of your product that gives people the ability to promote your product and earn a commission off of every sale. You see if you dont have an affiliate program, then youre leaving a lot of money on the table. Affiliates and joint venture partners can make you a lot of money, but the problem is that most affiliates programs dont provide the proper tools that affiliates can use to promote a product or service. Even with banners, solo ads, and more, there is still one method you can use to really take your affiliate program to a whole new level and make your affiliates happy. Why? Well, then theyll be happy to promote for you when you make their life easier to promote for you. Thats because most affiliates are busy promoting something, so their time is valuable. Its like giving your fans the necessary tools and training to spread the word about your products or services, which can be the difference between several thousand dollars and leaving money on the table. Ok, so lets talk about this powerful method in a little more detail.. I want to introduce you to boosting sales with bonuses, but with a twist. Im about to show you is often under-utilized by product creators. It is primarily used by affiliates, however when used by product creators you will multiply your profits greatly. Now in order for you to understand how this works, I will describe two separate views a product creator and an affiliate. An affiliate is someone who promotes a product in exchange for a commission or something in return. One powerful strategy to making more sales as an affiliate marketer when promoting products, is to provide buyers with an incentive or bonus that they will get in addition to buying the product. And buyers often look for the best bonus before clicking the buy button. The buyers get more than what they paid for simply purchasing through a certain affiliates link. The vendor makes a sale with marketing and the affiliate gets a commission. Its a 3-way win-win-win situation. 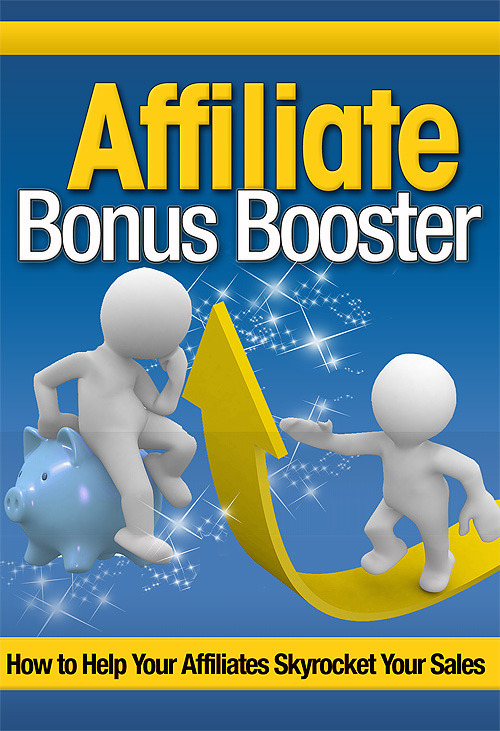 Now, most of the time the affiliates create their own bonuses and it takes time out of their busy schedule, but they see value in doing so so they do it. But if we reverse this strategy, it can be much more powerful when the product creator steps in and gives super affiliates these bonuses so they can start promoting. As a product creator, what if you created some of these bonuses as affiliate promotional tools? Imagine how powerful this could be for super affiliates that have the email list and the power to promote your product in an instant. The fact that you have created a bonus related to your product means that you have eliminated the time the affiliates have to invest. You see where Im going with this? By using these simple strategies, not only will you help your affiliates make more sales for you, but this system will help you pinpoint your super affiliates and help them make even more sales by giving them exclusive bonuses. - Ok I want to start, but what kinds of bonuses would people want? - If all the affiliates were given the same bonus, how will I really help the super affiliates leverage them? - I dont have any affiliates promoting, how do I find them? - Im not tech savvy at all, what do I do? If you answered yes to any of these questions, then all of these questions and many more will be answered in this video training course. Ill help you brainstorm bonus ideas customized to your own product that your future super affiliates will go nuts over. Ill show you ways to create bonuses fast. Ill even give you some super ninja strategies you can use to get super affiliates on board - even if you dont have any. With that said, you can put it all in action and start creating your profit-pulling automated membership machine today and avoid the mistakes that cost me thousands of dollars and hours of time - by watching this video series.